Following the launch of the iPhone XS and XS Max, owners began pointing out that the selfies captured on the new devices appear to apply a sort of smooth effect on the user's skin in certain lighting scenarios. 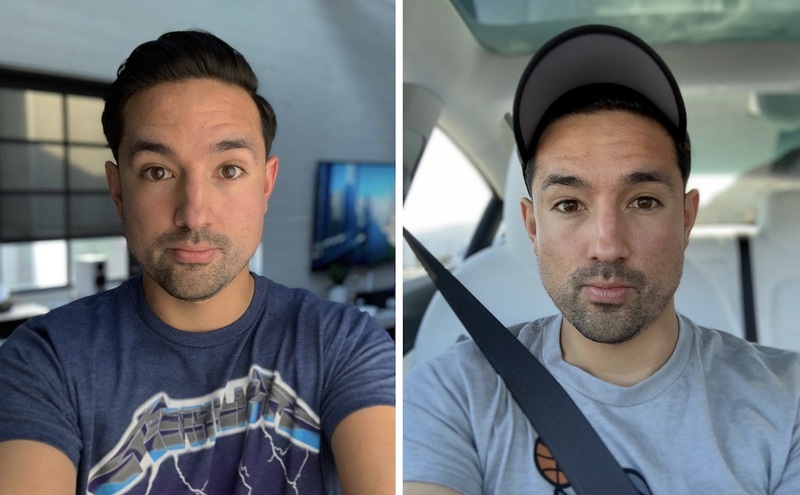 This was quickly dubbed "BeautyGate," with some users accusing Apple of building the new iPhone models with an internal "beauty filter" for better-looking selfies that aren't 100% honest. In an effort to combat the BeautyGate claims, YouTuber Jonathan Morrison posted a series of selfies on Instagram and Twitter over the weekend. In captions, Morrison said these were captured on the Google Pixel 2's Portrait Mode, and asked his fans their thoughts on how the images came out, particularly if they were better than the iPhone XS. Commenters said that the images rivaled DSLR shots and that the Pixel 2 was still among the best smartphone cameras, based on the pictures. Some even commended Google for producing high-quality selfies without the need for having a so-called make-up effect, and argued that the Pixel 2 had the best Portrait Mode of any smartphone. After all of this, Morrison on Sunday revealed that both images were not taken on a Pixel 2, but instead captured on an iPhone XS Max. So I just wanted it to be a little bit of a lesson out there: don't let a preconceived notion or headline skew your judgement. Because clearly, everyone who thought that it was a Pixel automatically assumed it was much better than the iPhone, when in fact that was the same iPhone XS Max that apparently had all of the BeautyGate problems. Still, Morrison explains that there is something happening on the front-facing cameras of the iPhone XS and XS Max, but it's not a beauty filter. Apple's latest smartphones take multiple pictures at varying exposure levels, requiring noise reduction that creates a smoothing effect over the entire image, not just on skin tones. The iPhone XS merges exposures and reduces the brightness of the bright areas and reduces the darkness of the shadows. The detail remains, but we can perceive it as less sharp because it lost local contrast. In the photo above, the skin looks smoother simply because the light isn’t as harsh. Observant people noticed it isn’t just skin that’s affected. Coarse textures and particularly anything in the dark— from cats to wood grain— get a smoother look. This is noise reduction at work. iPhone XS has more aggressive noise reduction than previous iPhones. It's unclear if Apple will choose to decrease the amount of noise reduction on the front-facing cameras of the iPhone XS and XS Max as a result of the user complaints. Always liked Jonathan. And this is genius! after the video was posted these fandroids were deleting their comments. absolutely hilarious. the hate for apple or even how far these losers go because you use a certain phone is astonishing. they need to get a damn life. Commenters said that the images rivaled DSLR shots and that the Pixel 2 was still among the best smartphone cameras, based on the pictures … both images were not taken on a Pixel 2, but instead captured on an iPhone XS Max. Fanboyism at it's finest. The truth is you can't really go wrong with the cameras of the flagship models on either side these days. There are subtle differences between them and most people won't even be able to spot the differences. When I make a smartphone purchase I first consider privacy, then security, then consider the design/ease of using the operating system, then the speed of the hardware, and then the design of the device itself. It is my opinion that Apple leads in all of the categories that matter most to me, therefore I buy Apple hardware. It also integrates directly into macOS, which I use to make money every day. There are other devices out there that might have longer battery life, or faster LTE, but those aren't things that matter to me. My iPhone battery lasts well over a day, and using a content blocker most web pages load within a second or two. Don’t understand why Android fans have so much hate for Apple fans. This just proves it. Just use the devices you prefer, no need to bring people down for what devices they use. Time and time again true ABX testing shows that it is extremely difficult to tell the difference and it can only be done on reference quality equipment with certain high dynamic range material like classical music. My dad one time humbled me when I said I can certainly tell the difference between margarine and butter. He got out 10 saltine crackers with either butter or margarine and gave them to me randomly. Damned if I couldn't consistently identify which was which. Well done Jonathon, excellent piece of work. Those people were very silly. Those photos certainly do make him look like he's wearing makeup, they were blinded by prejudice.